Hot Pot Inspired Hot Day Soup. It is hot, but all the same I wanted hot soup. Something that was quick to make so I don’t heat myself out of the kitchen. I got to thinking of HotPot. I figured I could probably pull something like that together. So I pulled out the cast iron Dutch oven and set to work. First I added about a tablespoon of rendered unfiltered (still had salt pork nuggets in it) bacon fat. I turned up the heat and melted it down. Then I added a box of Pacific brand mushroom broth (you could also use beef) and a 1/2 cup of water (careful of splattering grease) and brought it to a rapid boil. Next add about a pound of thinly sliced beef strips that you’ve let sit for about 15-30 minutes with salt on each side and a finely sliced jalapeño. Next in goes the green onion about 5 chopped up. Add some mushrooms, the fancy kind as pictured, also called shimeji if you want to get official. You can find them in the same section as the mushrooms in the grocery store in packages, you’ll use the whole package, just separate them from each other and drop them in. Now add 2 chopped garlic cloves and about 10 shredded basil leaves. Next up add a bunch of bok choy, chopped and two sliced tomatoes. 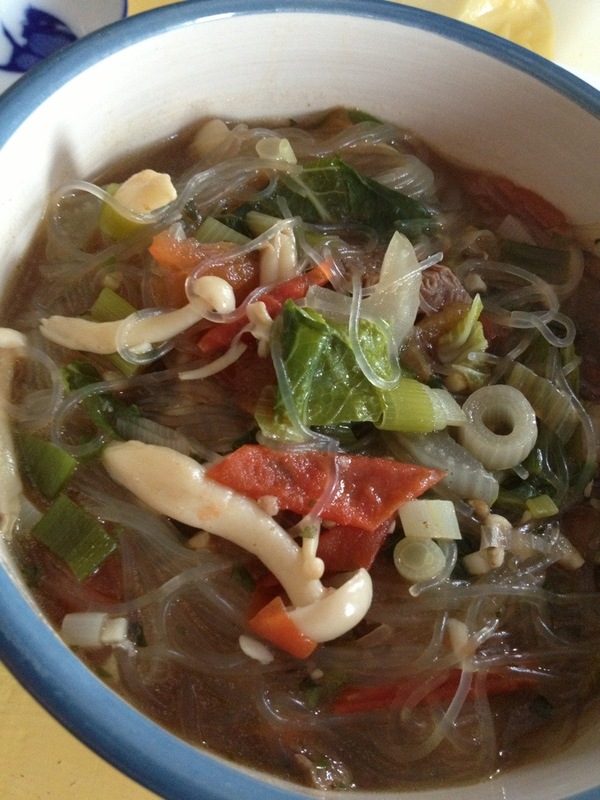 Turn off the heat and throw in some cellophane noodles (aka: bean thread noodles). It is super easy since really all you have to do is rinse, chop and boil. Since it only takes about 15 minutes top to make it won’t heat up the whole house. via Hot Pot Inspired Hot Day Soup.